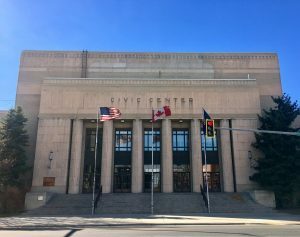 Great art and music is for everyone, and the Mansfield Center for the Performing arts in Downtown Great Falls hosts a variety of converts, ballets, holiday shows, stage productions, and is the home of the Great Falls Symphony. The plush Mansfield Center showcases its historic elegance through intricate architecture and acoustics that are unrivaled in Montana. The intimate 1,782-seat venue epitomizes why Great Falls is Montana’s Basecamp for Art & Adventure! A visit to Great Falls is not complete without enjoying a performance at the Mansfield Center. Here’s what to know before you go to make your experience a great one. There is no set dress code for events at the Mansfield Center, so wear clothes that make you feel relaxed and comfortable. You may see some people dressed in formal clothes while others may be dressed casually. Do not let your wardrobe keep you from enjoying a concert. However, if you want to dress up for a Broadway show, Symphony performance, or holiday concert, many downtown retailers are happy to help you find the perfect ensemble for your night out. The Blue Rose carries classic, quality pieces for men and women. They offer a friendly, no-pressure shopping experience that focuses on personal attention to the customer’s shopping needs and expectations. I love shopping, but I also enjoy browsing on my own. Sometimes I know exactly what I want to find and other times, I want to find a hidden gem. The Blue Rose offers both the personal service I need, and the space to find something new. I have found casual shoes, event dresses, and comfy work clothes, and since the Mansfield Center does not require Black tie formal wear, you will find the perfect smart casual outfit. 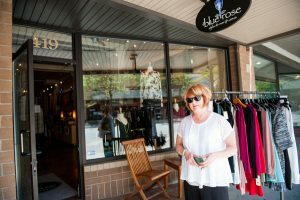 Located in the center of downtown Great Falls, the owner of the Blue Rose travels the country to bring established and newer designers home, so you don’t have to go to a large city (or online) to find sophisticated men and women’s clothing for any occasion. Other retailers such as Kaufmans, Dragonfly Dry Goods, Klover, and Sora & Co. offer top brands at great prices you’ll love wearing at the Mansfield. Wherever you go, you will enjoy an amazing shopping experience and be ready for the show. 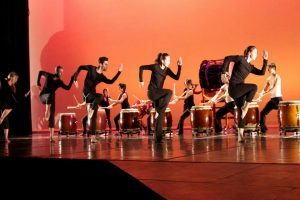 We invite you to experience one of the jewels of Great Falls, and we have included a schedule of upcoming performances to help you find the perfect event!